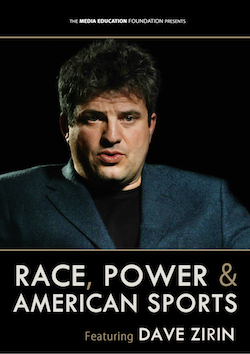 Cultural historian Dave Zirin, whose influential blog and bestselling books have offered searing insights into the politics of American sports, examines the myriad ways sports culture has worked both to reproduce and challenge the wider culture's dominant ideas about race and racial difference. Interviewed by Communication scholar Sut Jhally, whose own work has sought to clarify the relationship between popular culture and racial attitudes, Zirin's analysis ranges from the emergence of professional sports in the 1800s to today's commercial media sports spectacles to show how athletes of color have posed a direct threat to traditional notions of whiteness, white male authority, and American ideals of masculinity. The film is richly illustrated throughout with archival and contemporary sports footage. A vital companion piece to MEF's bestselling films Not Just a Game and Tim Wise: On White Privilege. "With Zirin no topic is sacred, no argument is ever evaded, no search for real truth is ever suppressed." "Dave Zirin shows us not only that sports can be a window through which we can examine the complex workings of race and class in this twisted, commercialized culture, but that it can also be a site of resistance." "Dave Zirin is the thinking man's sports fan and the sports fan's thinking man." "Race, Power & American Sports is insightful, incisive, and brave. It's a must-see. Dave Zirin is brilliant in tracing the complex intersection of race and sports in this country over the course of more than a century." "Full of excellent and instructive historical footage, Dave Zirin provides a detailed overview of the history and current state of race, sport and power in American society that will be useful for teachers and students, coaches, athletes and the wider public seeking to understand the place of sport in our society and culture." "Candid, provocative, and important. In Race, Power, and American Sports, cultural historian Dave Zirin and communication scholar Sut Jhally offer viewers an expansive and nuanced tour of the intersections between race, politics, and sport in America from the 19th century through the present. Regardless of how you arrive at the topic, whether you are a sport fan, a student of sport, and/or someone who is committed to understanding race in America, this is a DVD well worth watching and talking about." "Race, Power, and American Sports is an important film, unlike any other currently available. It provides an urgently needed counter-point to prevailing understandings of sport and society, offering viewers powerful tools to challenge media coverage, commercial images, and staged spectacles. Indeed, in a moment in which sport has become a common language to talk about human possibilities, social arrangements, and American uniqueness, Race, Power, and American Sports introduces a novel vocabulary to describe and deconstruct its social significance. Dave Zirin, in dialogue with Sut Jhally, interrogate the deeply entangled histories of racism and sport in the United States, offer a critical reassessment of renowned athletes -- from Jack Johnson and Jesse Owens to Jackie Robinson and Muhammed Ali -- that emphasizes the not only the complex social contexts in which they played, but the ways in which political, economic, and social factors have shaped how we remember them. Pushing back against the depoliticized narratives common to the sport-media-industrial complex Zirin highlights the linkages of play and power, athletics and ideology, and sport and struggle. While hopeful and engaged, this film is neither naive nor hagiography. It has a deep appreciation for sport but not at the expense of its disturbing force. Race, Power, and American Sports should be watched by anyone concerned with racial politics, social structure, or U.S. history, even those who think they do not have an interest in or affinity for sport. An excellent opening or addition to broader conversations about race and racism, cultural politics, and collective memory no less than in depth meditations on sport in American life. Highly recommended as a resource to develop critical literacy that embodies the best elements of MEF critical engagements."